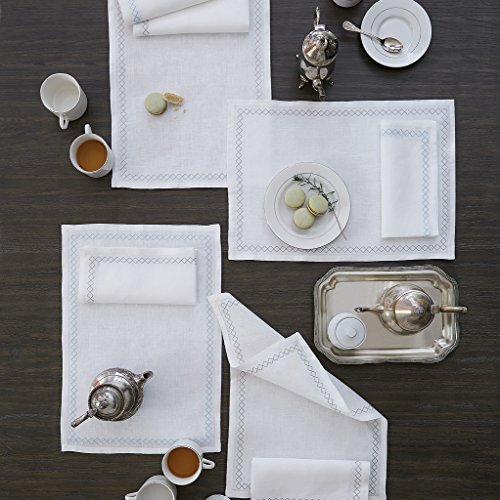 Diamonds symbolize not only love, but beauty, purity and abundance-and our Perry table linens embody them all. Pure white Festival linen embellished with delicately embroidered diamond borders, Perry feels both tailored and relaxed. In all, a lovely picture, and one you'll want to share. Country of Origin:LithuaniaFabric:100% LinenFabrication:Plain weave linen with machine embroideryHem:Plain, mitered cornersMachine wash cold water on gentle cycle. Do not use bleach (bleaching may weaken fabric & cause yellowing). Do not use fabric softener. Wash dark colors separately. Do not wring. Line dry or tumble dry on low heat. Remove while still damp. Steam iron on "linen" setting.